In the morning, prepare soaker. In the evening, dissolve instant yeast in lukewarm water. Add to soaker and all other ingredients for final dough. Mix on low speed for 2 min, until all flour is hydrated. Let rest for 5 min. Knead 2 min. on medium-low speed, adjust with water, if necessary (dough should be very supple and slightly sticky). Continue kneading for 4 min. more, switching to medium-high speed for last 20 sec. Dough should be still slightly sticky. Transfer dough to lightly floured work surface and stretch and fold 4 times, with 10 min rest after each folding (total time 40 min.). After last folding, place in lightly oiled bowl, cover and refrigerate overnight. Remove dough from refrigerator and either de-chill for 2 hrs. before shaping, or shape into batard when still cold. Place on parchment lined baking sheet, brush with egg wash and sprinkle with sesame. Score de-chilled dough at once; and cold dough after 1 1/2 hrs. (when turning on oven). 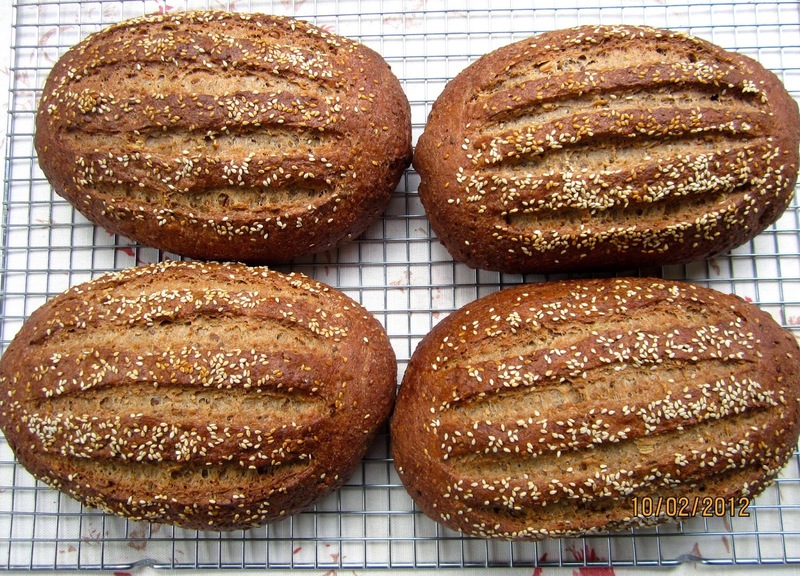 Mist bread with spray oil, cover and let rise to 1 1/2 times its original size (45 – 60 min for de-chilled dough, 2 – 3 hrs for cold dough). Preheat oven to 425 F, including steam pan. 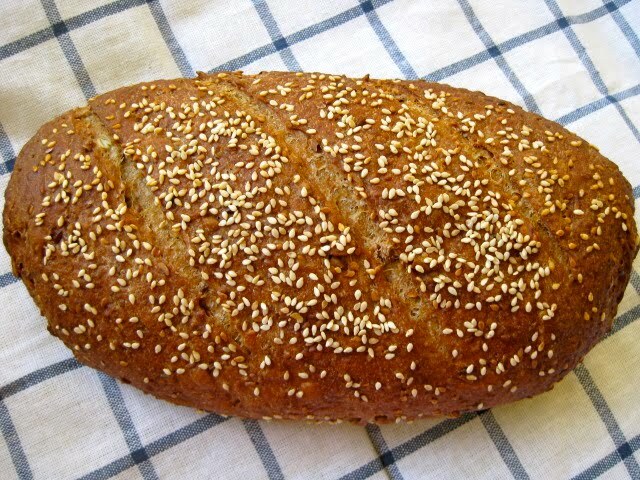 Bake bread 20 min. at 375 F (steaming with 1 cup hot water), rotate 180 degrees and continue baking for another 27 – 30 min. (internal temperature should be at least 200 F). 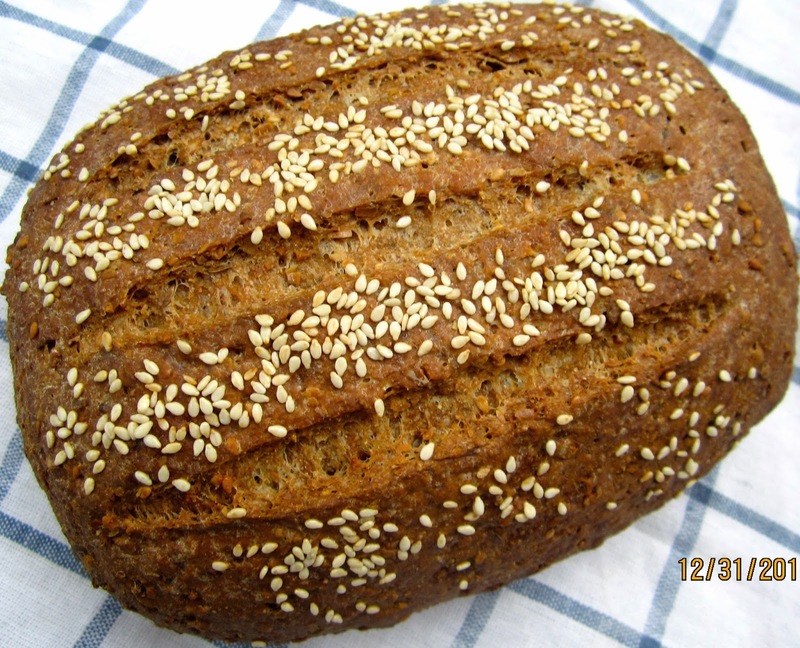 Adapted from Peter Reinhart’s “Whole Grain Breads”.